Chef Moshe Basson and health expert Christina Pirello put a vegan twist on a classic Arab dish. After changing location several times, Jerusalem’s Eucalyptus Restaurant has taken root in the prestigious Khutzot HaYotzer artist’s quarter in Jerusalem. 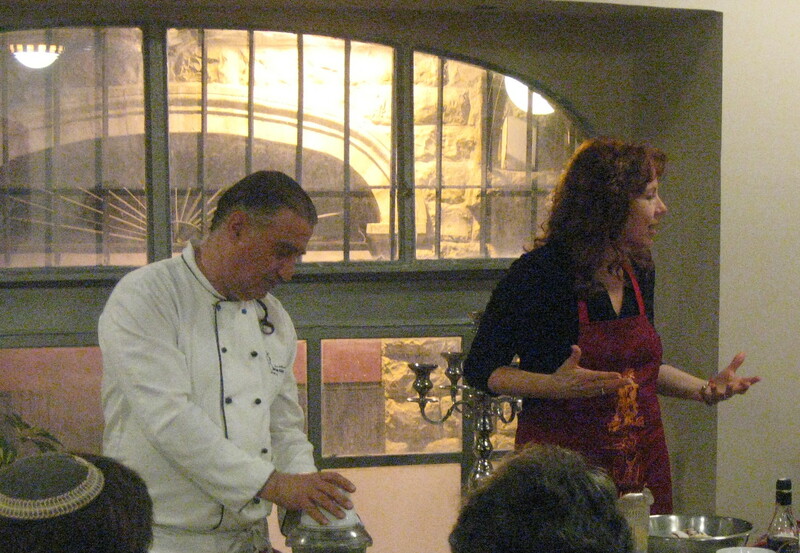 Chef Moshe Basson hosted a “Biblical Cooking Class” there last week, taught by visiting American health and nutrition authority Christina Pirello. Maqlub is a traditional Palestinian, one-pot meal that feeds dozens. It can be made with or without meat. While Ms. Pirello sliced fennel, onions, and lemons and chatted with the audience in the upstairs dining room, Chef Basson prepped the evening’s main dish in the kitchen. I was waiting to hear more about the foods of the Biblical period, but as the event progressed, it became evident that the focus was going to be mostly on macrobiotic and vegan cooking. I confess I was a bit disappointed, but the rest of the audience, composed mostly of English-speakers, was content. From what I could see, most of those present were already knowledgeable about, or at least in favor of, the macrobiotic/vegan life. “I swear, I’m ready to move here,” she said. “It’s the wonderful food, the friendly people. I was in the shuk (open-air market) yesterday, and I’m telling you, I’ve never seen anything like the abundance, the colors, the aromas, the sensuality. I wanted to buy everything and cook it all. “Israelis have a better relationship with food than Americans,” she continued. “Americans ask, what’s a sauté? Israelis ask, what’s the difference between a 5-minute sauté and a ten-minute one?” She added that she was impressed by Shabbat and how observing Shabbat rituals has preserved a strong connection to family and food. I asked Ms. Pirello to describe her impressions of Israeli food habits. I confessed I know little about macrobiotic cooking. “I don’t label my cooking macrobiotic anymore,” declared Ms. Pirello. She says that a strictly macrobiotic diet will move blood pH into a normal, slightly alkaline state where health and healing take place- but a body can’t sustain that forever. Judging by the mouthwatering recipes on her site – like vanilla flan (based on soy or rice milk) and spicy black lentils with candied onions, I’d say she’s right. We learned to make a pressed salad from those onions, fennel, and lemons. It had a generous amount of sea salt in it, which surprised some of the audience. Apparently salt is harmful only when added “cold” to finished food – when cooked, it takes its place as an important nutrient. 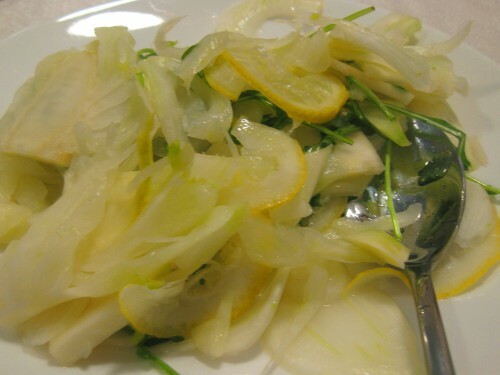 In this salad, lemon juice “cooks” the salt, and both act to marinate the vegetables. The result is that the salad isn’t considered raw. Ms. Pirello rubbed added lemon juice into the salted vegetables with her hands, saying that when the salad feels cold in the hands, there is enough salt. Then she balanced a stack of heavy bowls over the salty, lemony vegetables to press them down and reduce in volume. This salad should be eaten in small quantities at the end of a meal, as a digestive. Dinner, served after the cooking course, consisted of many little plates where lentils, black-eyed peas, stuffed Jerusalem sage (a specialty of Chef Basson’s), and the pressed salad disappeared almost as soon as they were served. To drink, water and hibiscus/sage tea. But for me, the main event was the appearance of Moshe Basson, banging a big tin platter like a gong while ahead of him walked one of his cooks carrying a vast pot of Makluba. 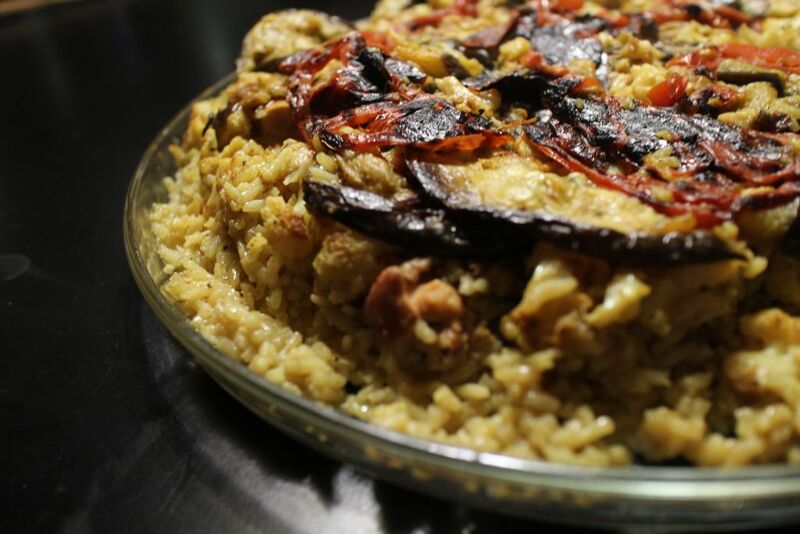 This classic Arab dish is usually made with chicken, layers of vegetables, and white rice, all cooked slowly in broth “till the bones melt,” said Basson. To accommodate the vegetarians among us, however, roasted fennel bulbs took the place of poultry, pre-cooked brown rice substituted for white, and instead of chicken soup, the dish was cooked with vegetable stock. I felt snobbish and thought that it couldn’t possibly come up to scratch, but was amused at the grand finale. Basson reversed the pot onto the big platter, and knocked on it a few times to loosen the food inside. Then he and Ms. Pirello stood with folded hands and prayed that when they lifted the pot, the dish hold its shape. Success! And delicious it was, too. I was happy to be wrong. Carrots, zucchini, fat Portobello mushrooms, and fennel, each separately roasted in olive oil and spices – brown rice made aromatic with Basson’s secret vegetable stock – I was in vegan heaven. Previous Previous post: Mozart, A New Natural "Drug" To Help Preemies Gain Weight? Next Next post: Burj Dubai towers above, but at What environmental cost? I've seen the unveiling of the Makluba at Moshe's restaurant for a number of high profile visitors to Israel from the US. A couple of times. The effect is always very impressive. And tasty. It's a great place for tourists to go, although the restaurant is not considered touristy. I am not into vegan or macrobiotic cuisine either but that makluba looks wonderful! the addition of fennel makes it unique.